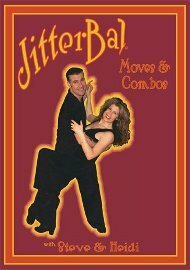 This instructional DVD is for the Intermediate Lindy Hop and Balboa dancer and contains exciting Moves & Combinations to make you an outstanding Intermediate to Advanced Bal-Swing dancer. You should know the Balboa, Bal-Swing and Lindy Hop Basics. This would be a good time to tell you to ALWAYS play these DVDs back at least 20 per cent slower than “real time.” Steve and Heidi talk fast and teach fast because that seems to be their normal pace in life. Hey, at least you know what the move will look like at full speed… Until you learn it however, slow down the playback and repeat as necessary. So much then - getting back to the moves - for what you’d call Balboa, or, Bal-Swing; the next thing is what they call “Hip Turns,” – which we know from WCS – and which should really follow the naming scheme they started with and be called, “Continuous Crossovers with Hip Turns.” But, why be picky? Be amused and move on. There’s more fun to come, like, “The Salsa Catch” – which has nothing to do with ruining your shirt, or, carpet, with salsa, and “Crossbody Leads” that look a lot like 6-count side passes, and “Elbow Catches” that look like upper arm “stops” – and on and on. Come on, “It looks a little like this - and it sounds a little like that…” Just roll. It’s not grandpa’s Balboa, but if he could do it all over again, he’d have fun with this.